Come see the awe-inspiring beauty of Alaska's famous singing whales. 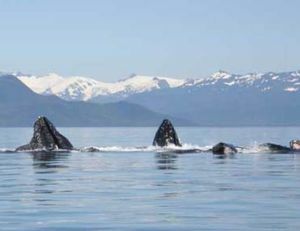 Humpback whales are summer visitors to Southeast Alaska's Inside Passage waters. 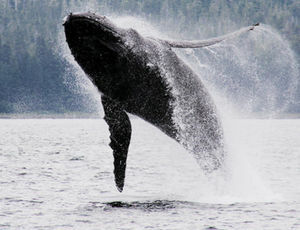 The playful whales are often seen playing on the water's surface, or breeching it with a a powerful lunge into the air. 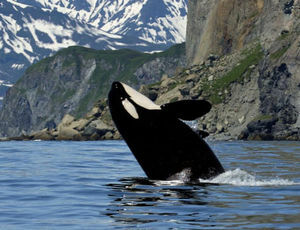 Orca, or killer whales, also frequent the area. 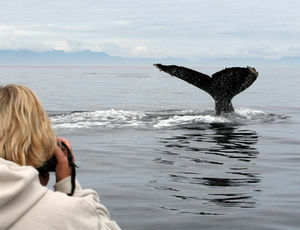 Frederick Sound has become a popular whale-watching site for both researchers and visitors alike. Bring your camera and binoculars because the list of sights to view is as long as our summer days. Come experience this paradise called Alaska. Keep your camera handy. 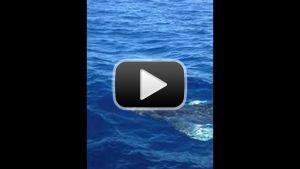 The whales like to come check out the boat, and you don't want to miss the photo of a lifetime. Baby humpback video taken in February in Maui, Hawaii. The cow and calf are likely to appear on the Southeast Alaska feeding grounds this summer; maybe even in Frederick Sound.